A sardine-centric story, surely not? Yes in a way, but this quirky tale is also a love story. Grandfather Lolo loves sardines; not so his wife, Lola, she hates the things. Nevertheless she runs a shop selling them because her husband spends his time fishing for them and she cooks them for him too –day in, day out – albeit with a clothes peg on her nose (and who can blame her for that). 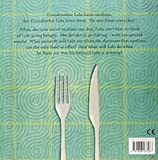 But then one day, disaster strikes: the shop runs out of sardines for her beloved’s supper. Something must be done so she takes a fishing rod and heads for the ocean and before you can say, ‘sardines’ she’s inside the belly of Jeff, the companionable octopus. Trapped therein, she starts to think to place is actually rather homelike: there are pictures on the wall, there’s even a little stove; but the only food on offer is, guess what? And as Lola’s tummy gets increasingly rumbly she decides to sample one - with surprising results. Back at home meanwhile a distraught Lolo misses his spouse and his tears becomes a sea upon which he floats… all the way out to the ocean and … a happy ending. Ridiculous? Assuredly, but delightful nonetheless, from one heart-shaped tail endpaper to the other. The characters are totally endearing (I love their tattoos) and despite being a veggie I found myself falling for this one wholeheartedly. 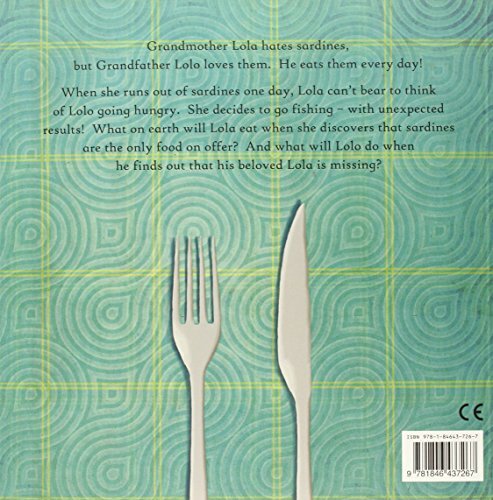 The visuals are superbly witty – take that bell ringing in Lola’s stomach when she starts feeling hungry, for instance, and the fishy décor in both Lolo and Lola’s old and new abodes. Delicious colour palette too.